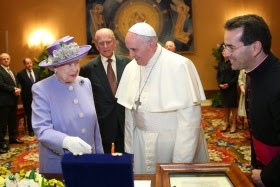 The big news today is that Prince Philip met the Pope. We are fans of Prince Philip Schleswig-Holstein-Sonderburg-Gluckberg here at the Leonard Pennario desk because we like worldly, devil-may-care older gentlemen who are not afraid to speak their minds. Catch the story here and while you are at it here is the Web log post that is the clearinghouse for all things Prince Philip. Read of the island where Prince Philip is a god! And is top 10 gaffes (or one-liners, as we think of them). It is funny that two years ago we were worried about Prince Philip being ill. Back when I wrote that post I was fibbing to my mother about it because it sounded serious. But now, in the video with the Queen, there he is, looking hale and hearty. Prince Philip lives! Here he is in the picture looking as if he is just waiting for an opportunity to cause trouble. 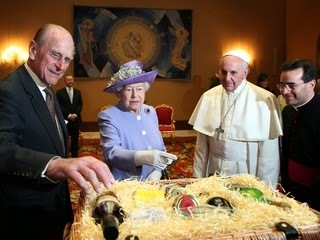 He and the Queen gave the Pope a bottle of whiskey. A very, very cool gift.